Lots of people think they’d love to eat for a living. Me? I’d kill for it. Which makes sense, coming from my family. FTD told my mother to say it with flowers, but she said it with food. Lost a pet? Your job? Your mind? Life always felt better with a serving of Mom’s braised short ribs or red velvet cake in your belly. In my family, we ate when happy or sad but especially, we ate when we were worried. The brand new Key Zest magazine in Key West, Florida announced a month ago that they were hiring a food critic for their style section. Since my idea of heaven was eating at restaurants and talking about food, I’d do whatever it took to land the job. Whatever. But three review samples and a paragraph on my proposed style as their new food critic were due on Monday. Six days and counting. So far I had produced nothing. The big goose egg. Call me Hayley Catherine “Procrastination” Snow. To be fair to me, some of the blockage could be traced to the fact that Kristen Faulkner—my ex’s new girlfriend and the woman whose cream sauce I’d most like to curdle—happened to be the co-owner of Key Zest. What if she judged the restaurants I chose impossibly lowbrow? What if she deleted my application packet the minute it hit her inbox? Or worst of all, what if I landed the job and had to rub shoulders with her every day? I hope you get the job because it might be that Kristen may be afraid of what you can do. Uh-oh, Hayley. Be careful what you wish for . . . This is one of my favorite people/authors/teachers. I don't know how I'm going to last until January!! Land the job and worry about the details later!! 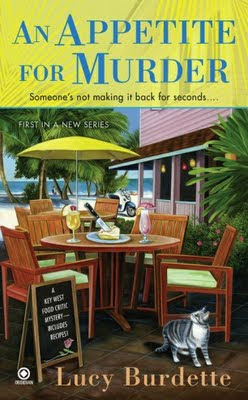 Well, that job could be murder ... but you've set it up so I can't wait to read and find out more! Sounds like it could be a deadly dilemma. Can't wait to read what happens! Hayley, I know all those feelings of angst! I'm rooting for you to get the job! Hope Lucy had lots of no cook recipes for you post-Irene.